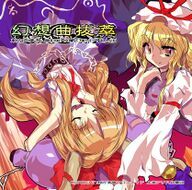 Collection of Illusionary Music (幻想曲抜萃 東方萃夢想 ORIGINAL SOUND TRACK, Gensoukyoku Bassui) is an official doujin album by Twilight Frontier and Team Shanghai Alice released on 2005-08-14 (Comiket 68). Hiroari Shoots a Strange Bird ~ Till When? "抜萃" in the title is the historic spelling of "抜粋", which is no longer used in Japan. The title means "Selection of Illusionary Music". This page was last edited on 20 April 2019, at 17:31.